The Billionty-Oneth Geek: Alice in Blunderland. I've been going through this ritual pretty much the past 6 years or so. Every Sunday I'll wake up (usually around noon), have my lunch with my desktop or laptop in front of me. I then check out Boxofficemojo.com to see the early estimates of how movies performed that weekend. I love movies in general but the geek in me pushes me further and I get intrigued by all the stats and figures associated with the movies. I love looking at how movies performed, whether they met budget and how fast, whether they underperformed, how they rank with movies of a similar genre and so forth. I don't know how it slipped past me, but somehow Alice in Wonderland made over $300 million since it opened earlier in March. It's an incredible number and I must have just glossed over it. You see, usually the only movies that past the $300M milestone are those giant-size budgeted summer blockbusters. So this is quite the feat. But is this high grossing number indicative of a great movie? Well, it was an okay movie, but with such a renowned fairy tale as the source material and Tim Burton at the helm, I guess I was just expecting a bit more. As far as the story goes, here is what I can tell happened. Alice is at an engagement party that she doesn't want to be at and ends up following a rabbit down a hole. 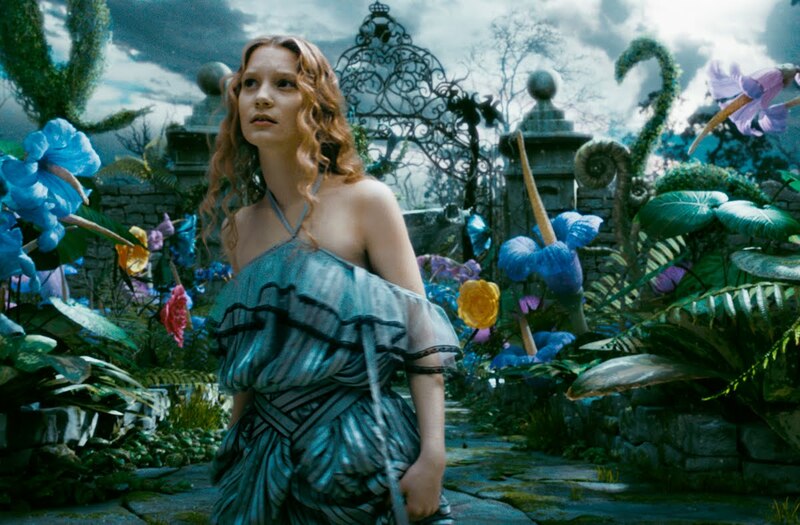 She arrives in Wonderland and its inhabitants claim that she is akin to a "chosen one". It is foretold in their stories that she will save them from a creature called the Jabberwocky controlled by the Red Queen. From there, it's a battle between the forces of good and evil, from the White Queen to the Red Queen. So really it was an hour and forty minutes of watching stuff happen. I loosely understood why people were doing what they were doing, but because of the lack of development in the characters, I didn't really care. The movie was beautiful to see onscreen and in 3D, but without the foundation of a good story, it sort of fell apart. I thought all the actors were fine in their roles and all the voices were well in matching their characters. I usually don't care for Helena Bonham Carter whenever she's in a Tim Burton movie (come to think of it, does she act in other movies?) but I thought she was pretty superb as the evil Red Queen. The role seemed to fit her more than any of her other roles in Burton's movies. Probably the biggest surprise for me was seeing Crispin Glover on the big screen. Yes, George McFly in a Burton movie! He was pretty great in his role as the slimy general in the Red Queen's army. He's come a long way since that night at prom in 1955. The makeup department managed to make Anne Hathaway look ugly. So really, who wins in that battle? We all lose. The two characters (or types of characters) that I enjoyed seeing the most were the Cheshire Cat and the Red Queen's Knights. I just loved the details they did with both these characters, from their looks to their movements. At times, the 3D did seem sort of distracting. I think I would have been perfectly fine with seeing this movie in 2D. The 3D didn't seem to add to my experience. I've noticed though, everytime in the past year that I've watched a movie in 3D, after 20-25 minutes I stop noticing it's in 3D. So really, I'm just paying extra money for those 20 minutes of experience. I've really got to rethink this. So in the end, I'm not really sure what to think of this. Perhaps thumbs in the middle, slightly pointed up. It was beautiful just admiring the visuals, but the loose plot left more to be desired. I'm not quite sure if it's considered a children's movie or not, but if it was, I think it would be too creepy for them, so be forewarned if you've got young'uns. Instead of inserting the trailer underneath, I've inserted this video I found on College Humour that pokes fun at Burton's style. I laughed and laughed because it's true. Later geeks! Yes. Lack of character development. That's what did it for me. You have to make me care about them first, and THEN I'll love the movie and care about what happens to them. Didn't happen in this movie.